I've been looking for Dia de los Muertos events here in El Paso this year, but it seems like there are fewer than usual, likely due to Halloween falling on Saturday. Here are ones that I could find, and I hope you will share with the page any additional ones. Dia de los Muertos Reception. The El Paso Museum of Art and the Consulate General of Mexico, El Paso partner annually to present a Dia de los Muertos altar. The 2015 altar (designed by the Chihuahua artist Ernesto Pinedo) will honor Dimetrio Macias, the main character in the novel Los de Abajo, penned by Mariano Azulea in El Paso. The volume is regarded as one of the most iconic novels of the Mexican Revolution. The altar commemorates the 100 anniversary of its publication and celebrates the centenary birth of Demetrio Macias. 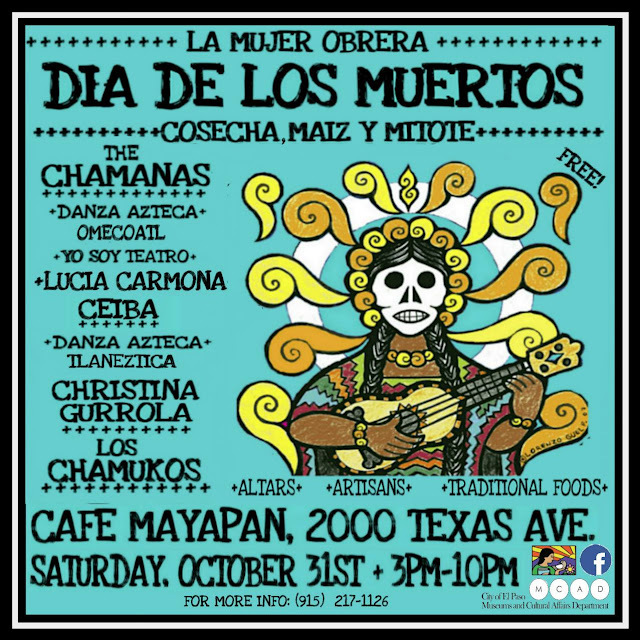 Pan de Muertos and Chocolate Caliente will be served. The altar will be on view October 27 through November 1 , 2015 in the C2 Gallery. Admission is free. La Mujer Obrera, a local non-profit, women’s empowerment organization invites the community to celebrate Dia de los Muertos: Cosecha, Maiz y Mitote. Featuring live music, traditional foods and artisans. Featured performances include: Danza Azteca Omecoatl, Wise Latina International’s: Yo Soy Teatro, The Chamanas, Lucia Carmona, Danza Azteca Tlaneztica, Ceiba, Christina Gurrola, and Los Chamukos. The community is invited to participate in Calavera Poems, Altars, and Catrina Contest. 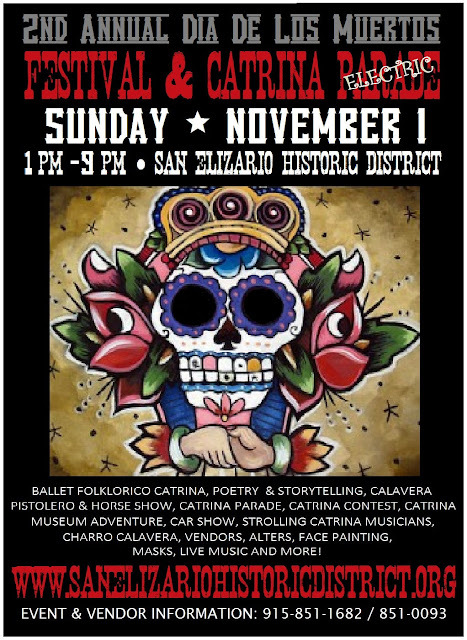 Activites include catrina ballet folklorico, poetry & storytelling, calavera pistolero & horse show, catrina parade & catrina contest, catrina museum adventure, car show, strolling catrina musicians, charro calavera, vendors, altars, face painting, ghost tour, live music and more. 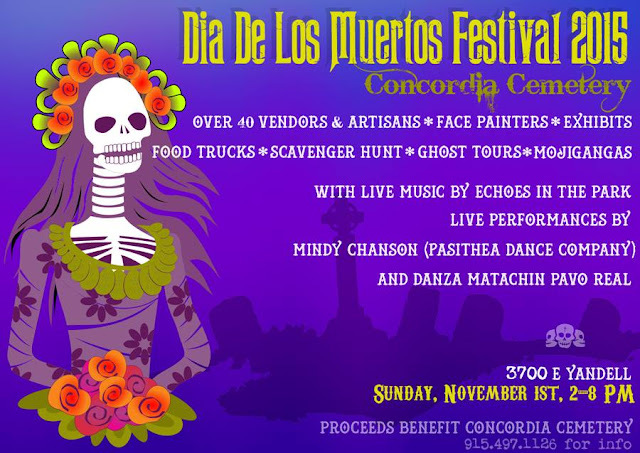 The Concordia Cemetery Dia de los Muertos Festival in El Paso, Texas, is a cultural and spiritual celebration that takes place annually and commemorates the loved ones we have lost. The one-day engagement sees revelers dressed in vintage Mexican clothes complete with skulls painted on their faces, and there are also 10-foot mojigangas (dancing skeleton puppets), a scavenger hunt, live music, poetry readings, arts and crafts and ceremonial offerings.